The Hotel Figueroa is a great place for weddings, and I absolutely love the fabulous color in the various hotel rooms. The use of a Moroccan theme in the hotel's color palette and decor provide photographers with endless possibilities. I captured this photograph right after the bride finished getting ready. She chose not to see her groom until the ceremony, which took place late night, after dark, on New Year's Eve. I photographed this image with and without the curtain on the back of the chair, and I ended up liking this one better, as the fabric led beautifully into the bride's head position. 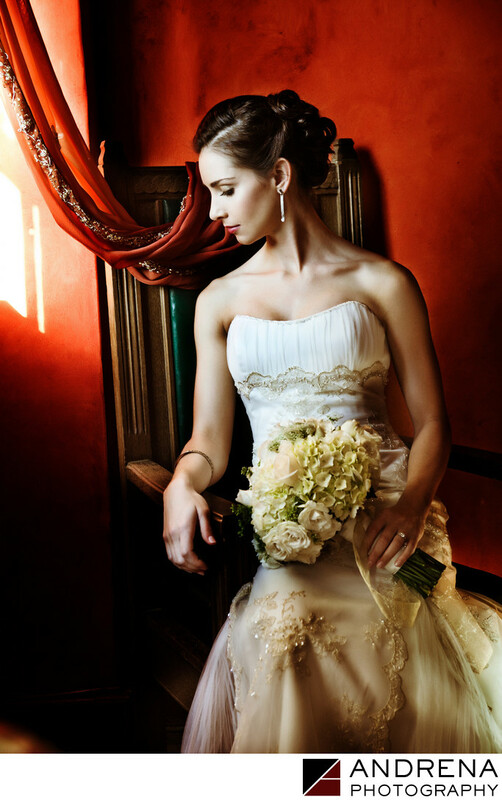 The color of the walls, curtains and chair all worked together to make this simple bride portrait more interesting. Christian wedding photographed at the Hotel Figueroa, Los Angeles.